At the invitation of our Quilt member, the Mid-Atlantic Crossroads, the Quilt will be holding its Fall 2018 Member Meeting in College Park, Maryland on the University of Maryland campus. We are very excited to have our Quilt community gather on this vibrant campus to learn, share and collectively advance networking for research and education. 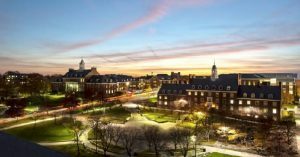 Building on the success of the colocation of the fall 2015-2017 events, The Quilt and the National Science Foundation’s Campus Cyberinfrastructure and Cybersecurity Innovation for Cyberinfrastructure PIs as well as ESnet, will colocating meetings this fall at the Hotel at the University of Maryland on September 25 – 27, 2018. We look forward to the opportunity to bring these groups together again with a colocated program along with several scheduled networking events. We look forward to seeing you all in College Park!